The art of cutting Serrano ham is leading the cutter, someone with good hand knives aroused admiration among the guests. Knowing how to cut serrano ham is a skill that requires knowledge, practice and a particular skill set indispensable addition to every good cutter tools. The art of cutting Serrano ham is easy to learn and a lifetime to master. A good cutter adds much to the ham, which is why those with particularly fine skills are admired and sought-after in traditional Spanish culture. To cut good slices of Spanish ham yourself all you'll need are some basic skills and the indispensable minimum of equipment. A good ham holder tops the list of materials needed. The support will be the basis on which the hind leg is placed to cut more comfortably and safely. There are a wide variety of models of ham holder from which to choose, but the most important factor is that it be stable and hold the Spanish ham steady. A- Wide blade knife: sharp blade, wide but fairly short and stiff. This knife is used to peel the Spanish ham, remove the superficial fat and work in the area of ​​a small carafe. It is used to prepare the piece before starting to cut slices. B- Ham knife: its flexible, elongated, narrow blade must be very sharp to fulfill its function properly. The ham knife is used to make precise cuts that result in thin slices. C- Carving knife: A robust blade, somewhat narrow and short. Used to work in the most complicated areas of ham, where the proximity to the bone leads to sharp angles that hinder precise cuts with a longer knife. We do not recommend sharpening the ham knife with a whetstone. The tool indicated for this function is the sharpener. The movement that's going to give you a sharp knife begins at the tip of the sharpener, where the base of the knife blade is placed. The blade is then smoothly slid in a diagonal movement, until the tip of the knife blade meets the handle of the sharpening steel. Note that the steel doesn't move, only the knife! Wipe down the steel between sides of the knife, and coat lightly with a tiny amount of oil when you're going to store it for a while unless you know it's stainless. 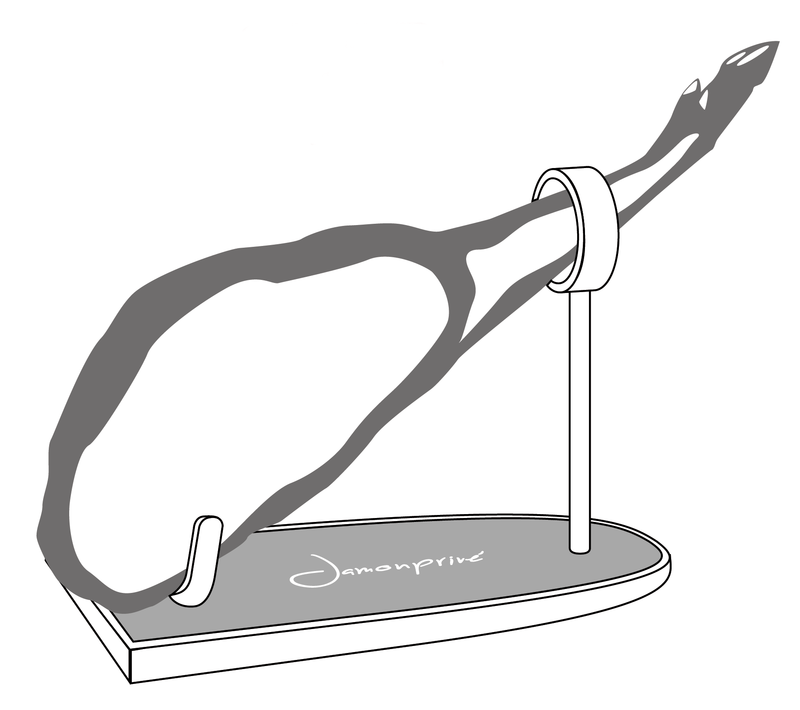 The position in which the Spanish ham is placed in the support depends on the number of slices you want to make. If you place it hoof upward, you'll find that it's best suited for large slices and for eating the whole ham immediately. If you plan to take several weeks to eat your Spanish ham, it is best to start cutting at the stifle, the thicker part of the leg, placing the ham hoof down in the ham holder. After determining the position of the ham it is time to secure the support, with the spike sticking in the area corresponding to the hip, and properly adjusting the thumbscrews in the area of ​​the hoof. It is advisable to place the stand on a sturdy table that allows the cutter to work with ease, securely and at roughly the right height. In this step it is also important to predict how many slices you will need, because the size of the opening you cut will depend on this. If too large an area of Spanish ham is peeled, the meat will dry out and lose some of its juiciness and flavor. The first thing you should do is remove the skin and the yellowish surface fat. It is possible that as the cuts are made you will come across moldy areas. These are part of the natural result of drying and ripening and cutting them away is sufficient: they do not involve any risk. Once you have peeled an area of ham, you can start cutting Serrano ham slices. If you want to cut long slices, about six inches, you just have to make parallel cuts covering the area form the hip to the hoof. To get regular slices the same thickness, you'll need to carefully control blade angle and pressure and make parallel cuts. Since the texture of slices ​​changes, depending on the area they're cut from, it is advisable to combine slices from different parts of the leg so that the dish of Spanish ham is more tasty and varied. For example, near the knuckle the meat is drier, while in other areas of the piece slices are juicier and have more fat marbling. To cut slices of the hip area, which will also be drier, you must use the appropriate tool, the boning knife. Vertical cuts should be made until it is possible to extract more slices. At this point you can always cut diced ham, ideal as ingredients for traditional recipes of the Iberian Peninsula. Remember that once you have consumed both sides of the Serrano ham (the hub and the stifle), you can use the bone to make soups and broths. The steps described above are just the same when you're cutting a Serrano shoulder rather than ham. The only real difference is the placement of the bones in the piece. The more bony, more complex shoulder requires shorter, more robust knives and there is a knack to extracting the best cuts from around the scapula where the meat is very juicy and flavorsome. Otherwise, there is little difference and you should be able to get a good result following the steps above.